In spite of showing a great attacking intent throughout 90 minutes, Aizawl FC and Kingfisher East Bengal could not break the deadlock until the final whistle only to split the points between themselves at the Rajiv Gandhi Stadium in Aizawl today (January 16, 2018). The home side made three changes in their starting XI as Syhlo Malsawmtluanga, David Rinmuana and Yugo Kobayashi made way for Leoce Dodoz, William Lalnunfela and youngster Hmingthanmawia. Kingfisher East Bengal made a sole change from their last game as Lalramchullova replaced Mohamed Rafique. The game started with a high tempo as the home side pressed for an early goal. Liberian midfielder Jaryan shot flew just wide of the post and William Lalnunfela was awarded a golden opportunity by Albert who sent a wonderful pass towards the box just for William to waste it from 6 yards. The away side grew in confidence and Katsumi was looking most dangerous, especially from the dead ball situations but Avilash Paul stood like a rock between the Japanese and the back of the net. Just after the clock crossed the half-hour mark, Katsumi stepped up to the plate but he was unlucky as his thunderous shot struck the crossbar, the rebounded ball was again poked towards goal but Aizawl goalkeeper Avilash pushed it over the crossbar. The away side introduced local boy Brandon in the first half but the diminutive, yet tricky Mizo winger couldn’t influence the game in favour of his side. With the quarter of the game gone, Jaryan again tested East Bengal goalkeeper Barreto with his powerful right foot shot, Aizawl fans jumped in euphoria but Eduardo thwarted the danger away much to the dismay of the home fans. The second half began with a heated altercation between both sets of players as former Aizawl midfielder Al-Amna and Afghan defender Masih Saighani were both booked by referee Rosario Fernandes. Midfield battle was the highlight of the game as both sides found it hard to engineer an open goal-mouth action. Brandon’s curling effort from outside the box was miraculously palmed away by Avilash Paul to keep the scoreline unchanged. Menezes introduced local striker Lalkhawpuimawia in search of goal and Khalid brought in Willis Plaza minutes later, both teams fought for the three points but a goal eluded the game. Both teams failed to score a goal as the match ended on the same scoreline. The home side have now amassed 14 points from eight games while Kingfisher East Bengal maintain the second spot on the table having bagged five points more form 10 games. 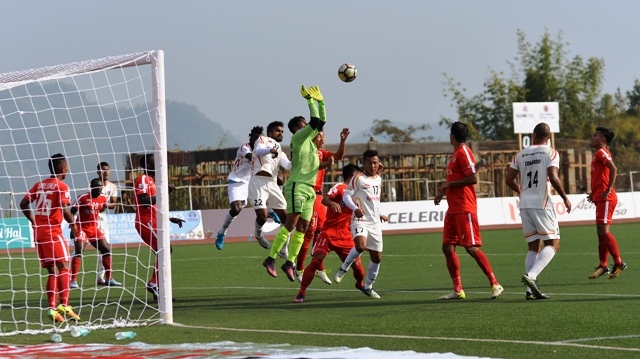 Aizawl will host Neroca FC on January 20 in a mouth-watering Northeastern Derby whereas the Red & Golds will lock their horns with Mohun Bagan in the much-anticipated Kolkata Derby one day later.